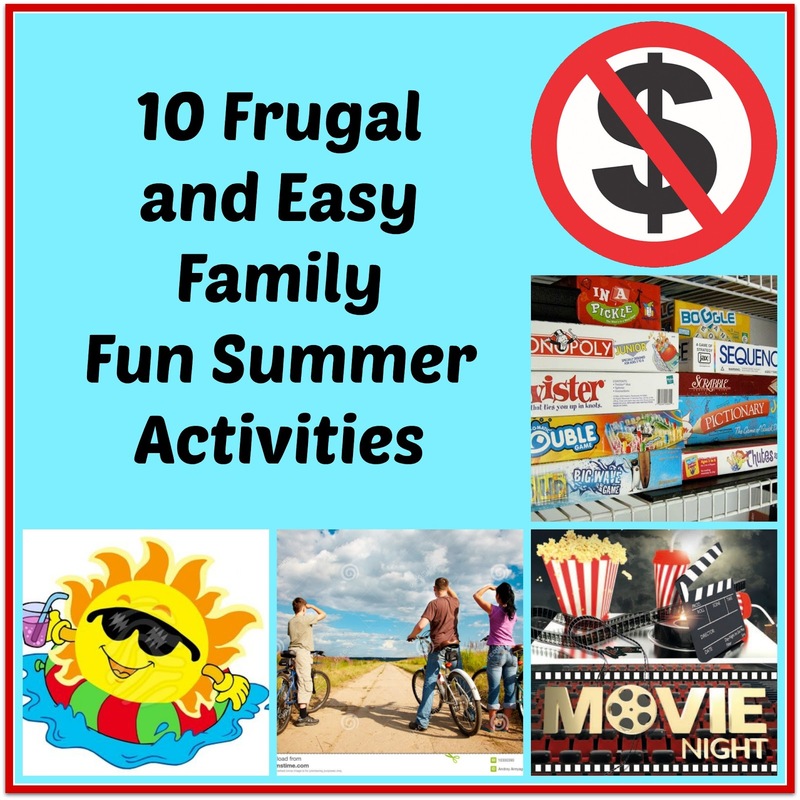 Now that summer is in full force for many of you, you'll no doubt be looking for some fun ways to occupy everyone's time during the long days of summer vacation. Personally, I've always thought summer vacation was just too long. I know my children will definitely disagree with me; but I also know that by about the second week of July, the novelty as worn off, if not actually long before then. My kids are a little older and tend to entertain themselves quite sufficiently, so I don't get a lot of dramatic "Mom, I'm bored!" Cries coming from any of them. Still, summer is a great way to spend time together as a family doing simple things. Going places and doing things together is a lot of fun; but can also be expensive. This is especially true if, like me, you're beyond the "let's go play at the park" stage. Don't worry, though, there are plenty of things you can do at home with things you probably already have in your mom and kid stuff aresenal. Here are just a few ideas and things we do together. Please note, that this is by no means the most comprehensive list you'll find out here in the blogosphere. There are plenty of great links out there with much longer lists than I have here; but I wanted to give 10 quick to read ideas! Board Game Day and Snack Day. This is a super easy one. Summer vacation days are perfect for playing board games. You can either play a lot of quick games or you can finally get out the Monopoly game you never play because you never have time to finish it. Make this fun day even better by setting out fun snacks and letting the kids pick some fun music. Indoor Olympics. Depending on how many people you have at home with you, this can be a fun way to spend an afternoon as well. Just pick a few events and let the competing begin. We've done this with Wii Bowling, followed by bean bag toss, a foosball tournament, balloon volleyball and glow ring toss. Keep a tally and give out Gold, Silver and Bronze "medals" to the winners at the end! Water Games. For those really hot summer days, take everyone outside for some fun family water fun--Squirt gun painting water fights, water balloon baseball, super soaker gun fights, fill the water bucket game, or just let them go to town with the hose and sprinkler! If you're really good...you'll figure out a way to get your car washed while there out there as well!! Family Wii Day. Technology doesn't have to be a bad thing! Use it as a tool for spending time together. There are tons of family fun games for the Wii (and I'm sure the Xbox etc as well) Get up and get moving together! Minute To Win It Games. This is one I plan to use this summer. There are tons of games out there that you can find on Pinterest and (well, wherever it is you go to find ideas) Most only require a few simple things which you should have already or can get rather cheaply at Wal-mart or perhaps the dollar store. Movie Day. Close the curtains, pop some popcorn, have some candy and throw down pillows and blankets and spend the day being completely lazy! Science Day. You can scour through many Pinterest boards and discover some great science experiments that can be done easily at home. What's really great is that many of them only require things you already have on hand: dish detergent, baking soda, water, hydrogen peroxide etc. Explore your Neighborhood. Another great way to spend a day is to just get out and explore your neighborhood and local community. Even if your kids are too old to "play" at playground, you can still look for hiking trails, or go for bike rides. Maybe there's a park and a pond that would be perfect for a picnic lunch? Check the community board at your local library for free or frugal family events around town. Do a online search for restaurants in your town that offer free kids meals on certain days. Grocery Games. Play your own version of this popular Food Network game. This is a great thing to with older children. The only caveat is that the more children you have, the more expensive it could be; but still fun! First, spend a little bit of time talking about the main food groups, and what healthy food choices really mean. Then head to the grocery store and tell them that have 15 minutes to shop for the ingredients to make something....an easy one might be sandwiches. Tell them they must include a source of protein, and a vegetable (or whatever you want) and they can only spend $7 (or whatever) Then go home and everyone makes their own sandwiches for lunch with the ingredients they chose. That is all for me today, thank you so much for visiting with me. I hope you have a fabulous day!